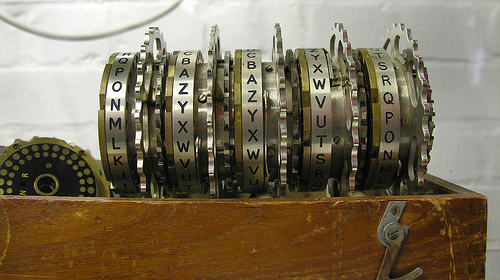 As promised, it’s time for a little primer on encrypting your files. In this article, we’ll focus just on what Apple has already provided you on OS X, and how it can be used to secure files and folders on your system. There are two basic ways to go about this – both using features of things that are primarily intended for a different purpose. The first is Disk Utility, which is primarily intended as a disk repair and imaging utility. But it can also be used to create a disk image that contains a folder’s worth of encrypted files. Likewise, Print to PDF is a way to create a standard-format file that you can send to people on any OS. But it also includes the option to password-protect your file, so even if that option isn’t available in the original file’s format, you can still get the additional protection. Don't forget that adding a multi-layered approach to security is the best method to secure files on your Mac. Download Mac Premium Bundle X9 and get the most complete Mac protection software today. These instructions assume you’ve already made a folder that’s now waiting to be encrypted. If you’ve not yet done that, go do it. It’s okay – I’ll wait. …Okay, you’ve got it? Off we go! To start this encryption adventure, we need to start Disk Utility. It’s a whole lot easier to use Spotlight to find this, but if you want to use Finder, you’ll need to go into the Utilities folder to locate it. Once you’re there, go into the File menu and choose “New Disk Image from Folder” (or type shift-command-N). Now go find that folder you made and select it. Now, pick your encryption method and save. You’ll be prompted to enter a password for your new encrypted disk image. You can now open this disk image to use files as normal, but when you close the image it will be encrypted. Once again, we’re going to assume you have a file somewhere that you’d like to encrypt. 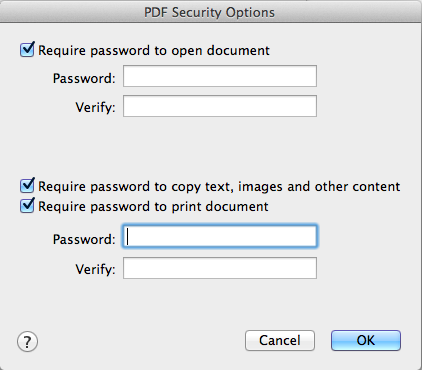 This will work for any file-type that gives you the option to “print” a file to PDF. Before you save the file, be sure to click the “Security Options” button. There you’ll see a variety of ways to go about password-protecting the content. Enter passwords for whatever options you choose, and save. What Encryption Algorithm is used? We’ll get into more depth in a future article about different encryption algorithms and why you would choose one over another. But since we’re just discussing what Apple provides to everyone, I’ll just tell you what algorithms are offered in these two scenarios. As you may have noticed, Disk Utility gives you two options, and lets you know that choosing the more secure option is somewhat slower. This is a truism for all security matters – more secure is necessarily slower. You can choose from 128-bit or 256-bit AES. “Print to PDF” only offers one algorithm, which is 128-bit RC4. These options aren’t the most secure by any stretch, but they do the trick for most day-to-day purposes. They will help make it more difficult to gather data from your files or folders, so that you can share or back them up with more peace of mind. Open Disk Utility (go to Finder > Applications > Utilities folder). Once there, go to the File and choose New > "Disk Image from Folder..." (or type shift-command-N). 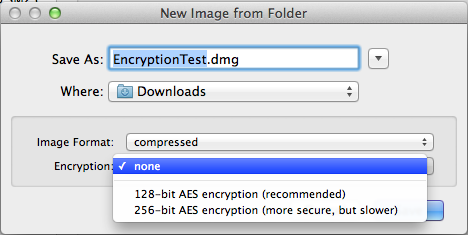 Select the folder you want to encrypt, and then click Image. Now, pick your encryption method and click Save. You'll be prompted to enter a password for your new encrypted disk image, type in any password you want (just make sure it's secure!). You're all set! As mentioned above, you can open encrypted a disk image to use files, and when you close the image it will be encrypted. You've encrypted files on your Mac, now what? 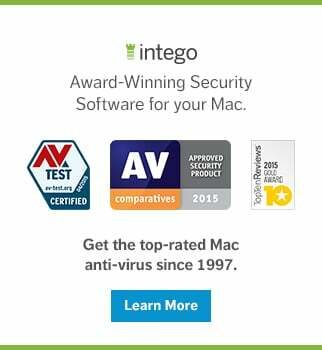 We recommend a multi-layered approach to security, which is the best way to secure your Mac from all threats. 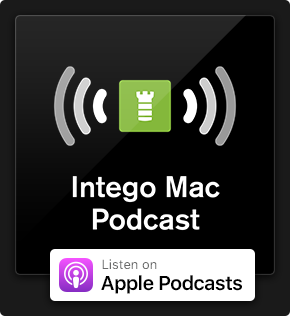 Protect your Mac against malware, strangers, and suspicious applications with Intego’s award-winning Mac Premium Bundle X9. This entry was posted in How To, Recommended and tagged Apple, encryption, FileVault, OS X, Print to PDF, security. Bookmark the permalink. Right-clicking on a partition of drive will also give an option to encrypt. This is true! Bringing up the context menu also allows you to encrypt removable drives. You are explaining how to encrypt a drive volume, not a folder. I was able to create and mount the DMG, but unable to move anything into it. When I do get info, it says I can only read, but the permissions below it indicate otherwise. I’m confused . Any suggestions? I think you may have had a similar issue that I had. I found that I needed to encrypt the document first (rather than the folder) and place the encrypted file(s) in a new folder, and then encrypt that new folder containing the encrypted file(s). The you should have a password-protected folder that contains password-protected documents. Instead of creating a “compressed” disk image, click the drop down menu and select read/write. This produced a disk image that I could put additional things into. That solved the problem for me. Although for some reason I can’t put very much information into the encrypted DMG. Even 10MB was too large. Is there a setting I missed that asks for a folder size? Do not select the “Image from Folder…” option, but select the “Blank Image…” option. That has the required imagefolder size field. I tried, and it worked ok. If you don’t have the password, you’re probably f*cked. 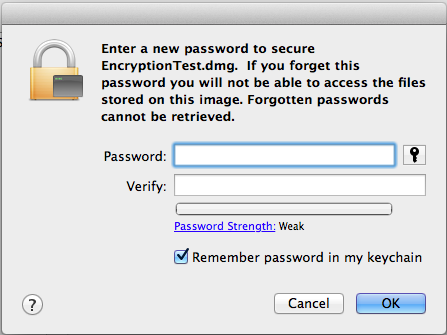 When I finish encrypting it, I open it again, however, it doesn’t show a enter-your-password-thingy or anything else. It does work on folders right?? You need to uncheck “remember my password in keychain” in the password creation window. If it is checked, the encrypted folder will automatically open via the Finder if it remains on your computer, but will require a password if it is moved off.